//Sub/Corpus Blog: Budget.mv: This is beyond stupid !!! Budget.mv: This is beyond stupid !!! 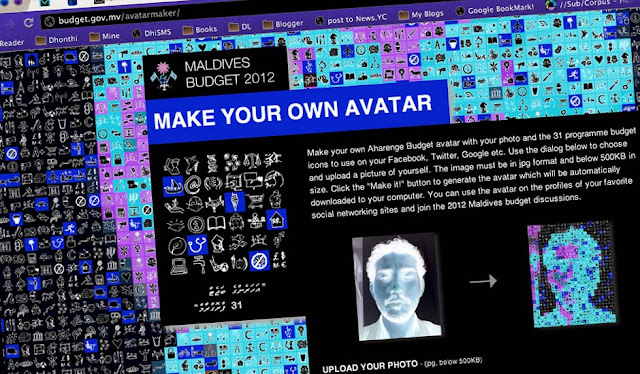 Why does our National Budget website have a section to create your own avatar using 31 programme budget icons? I have no vague idea! I can understand if this was on a private or a commercial website marketing a product or a brand. I might even understand this on Tourism Portal website using unique Maldivian icons to make an avatar which might appeal to a foreign visitor. I don't know about everyone on the internet, but I would usually visit a government website when I need to look up current and accurate information or when I need historical data for a research project. I visited the Ministry of Finance website to have a look at our National Budget. I wanted to see how much the projected national revenue was and how it has been sliced to be spend on health, education, transport and infrastructure projects among others. While looking at the budget, I did find some ambitious projects while huge sums of money have a been allocated to highly controversial and still hotly debated projects. I guess that will always be the very nature of every annual national budget of any given country. However, during no time that I spent on that website did I have the slightest inclination to upload my photo and make an avatar to use on any social network. I don't really know where to begin to tell someone how inappropriate this is. I think its highly unprofessional for an official government website. But thats just me, your mileage may vary. So, go ahead, give it a shot if you so want. In the mean time I'll visit the Health Ministry website and try to find an online game you can play while you wait for them to activate our free health insurance! usually these are marketing tricks to market a brand or product. maybe our government is also in need of marketing their budget to its people. Really, MooInc? Didn't know that. Maybe they are doing a good job at it? isn't this the first time that a proposed budget been published and made available on the internet, for everyone to see and be aware. i think the idea is to stop being ignorant about the national budget and get people involved. but like everything else we'll be stupid and ignore what really matters. may be that's the way they can spend the last bit of money in their budget before the end of the year. its to distract people from looking at the budget.... "ooooo.. shiny.."